Diamond Waste Services London | What we Take | How Much? Once we know how much waste needs collecting, we can give you an estimate and a slot for collection. This could be the same day, next day or at a time that suits you. Call now on 0800 138 9100. The team at Diamond Waste has vans operating all over London, Surrey and Kent. We can move your waste or unwanted items anywhere, including gardens, homes and offices. All our drivers are polite, courteous and friendly. We are trained to lift and remove items whilst leaving the area clean, tidy and safe. Make your booking. Diamond Waste pricing is completely transparent with no hidden fees. A no obligation quote is offered before collection. A bespoke serviced is offered for all clients, no matter the location. There is no need for skip hire with Diamond Waste. 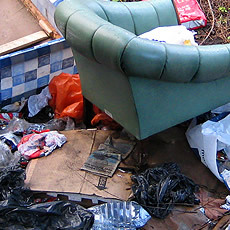 Find out about our rubbish clearance services.